I talked to a friend of mine living in the district Durg. One thing which I understand about Durg is that it is home of Pandwani singers. Today, I am talking about the great folk singer of our state who brought India into the limelight in the world arena. She is Teejan Bai. Before I move further, let me talk about what Pandwani is. 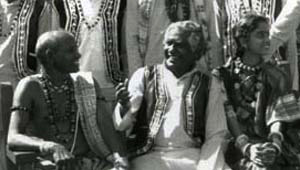 Padwani is a singing style of folk songs narrating the stories of the greatest Indian epic the Mahabharat. The style has got a couple of poses called Vedmati and Kapali; Vedmati is sung mainly by sitting while Kapali is done by standing. Teejan Bai: the Pandwani Singer, began his career performing Vedmati style but later she gained the expertise over both the style. Pandwani derives its name from Pandava i.e. the five brothers in the epic the Mahabharata. Thus, Pandwani revolves around stories of machismo and bravery of the Pandavas especially when they were on exile for 14 years. Teejan Bai was born to Mr. Chhunuk Lal Pardhi and Mrs. Sukhwati on 24 April, 1956 in Ganiyari village of district Durg in Chhattisgarh. At the tender age of 13, Teejan Bai learnt the longest verses of the epic by heart and started performing. She gave credit to his maternal grandfather Brijlal Pradhi for teaching her the Mahabharata in the local dialect called Chhattisgarhi. Later, Umed Singh Deshmukh gave her formal training for that. She began her career as a Padwani singer at the age of 13 and brought the style of folk singing into the limelight. She belonged to a tribe called “paridhi” and got married at the age of 12. 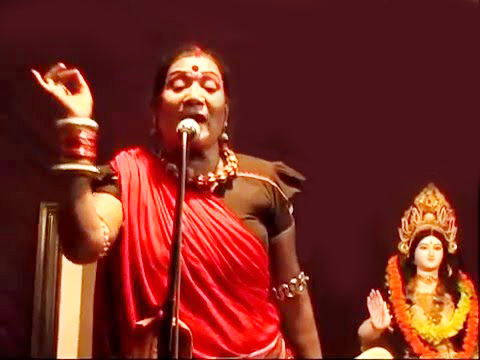 The community expelled her for singing Pandwani which was male dominated form of songs at that point of time. She had a tough time after being expelled from the community. They say she had to borrow utensil to cook her daily food. She gave her first performance at village Chandrakhuri in district Durg for Rs. 10. She swept the audience at the performance and became famous in the neighboring village too. Her unmistakable verse made an outstanding performer in Pandwani. Her career took off when the noted theatre personality Habib Tanveer gave her opportunity to perform for the then Prime Minister Mrs. Indira Gandhi in Delhi. Later she gained the global recognition winning the coveted prize of various government and non-government organizations. She not only performed in India but also swept the audience in abroad which include England, France, Switzerland, Germany, Tunisia, Malta, Cyprus, Romania, Mauritius etc. Today, she works for Bhilai Steel Plant and lives in Bhilai. She has been felicitated with many awards and has been honoured by Padma Shree in 1988. In 1995 she got the Sangeet Natak Award. The Bilaspur University honored her with the Doctor of letters (D.Litt.) in 2001. She was given Padma Bhushan in 2003 for her outstanding contribution in the field of Pandwani. She is an inspiration to the children of Chhattsgarh. I am proud to belong to the state she lives in. She turns 71 today. Ritu Verma, the other Padwani singer, is working her legacy.